Echinacea, commonly known as Purple Coneflowers, are quintessential prairie plants. They are hardy, drought tolerant, long-blooming, and are being cultivated in a ever widening range of colors. It’s hard to find a garden without at least one variety. Echinacea is a native North American genus with about 10 species. Not all make great garden plants. Echinacea purpurea is by far the most popular. It has a more fibrous root system, rather than the long tap root and woody crown found in other wilder species, and is more adaptable to garden conditions and more forgiving of dividing and transplanting. The daisy-like flower is actually made up of several small flowers. The petals are sterile and are there to lure insects toward the many fertile flowers in the central disk or cone. These flowers are rich in nectar and very popular with both bees and butterflies. Flowers were generally some shade of purple or lavender, with a dark center cone. Much hybridization has been taking place and you can now find petal colors ranging from white to green through yellow, orange and deep reds. The common name “coneflower” refers to the way the petals angle backwards, away from the center, forming a cone. Growth starts with a clump of basal leaves, which eventually send up flower stems in mid-summer. The leaf shape depends on the variety. Many have oval leaves with a wide base, but some from dry, western areas often have narrow leaves. Light: To get the most blooms and the sturdiest plants, plant them in a spot that gets at least 5 hours of full sun a day. They will tolerate partial shade, but plants may flop or strain to reach the sun. Hardiness Zones: Coneflowers will grow well just about anywhere and are labeled USDA Hardiness Zones 3-9. You may want to give them a little winter protection their first year, but once established, they are rugged and hardy. Soil: Most Coneflowers grown in gardens prefer a neutral soil pH of about 6.5 to 7.0. Fertilizer: Although they thrive best in a soil high in organic matter, too much supplemental fertilizer can cause them to become leggy. The new hybrids need more TLC than the species. If you don’t want to start your own seeds, there are plenty of varieties available for purchase as plants, especially through mail order. Plants can also be divided or grown from stem cuttings. 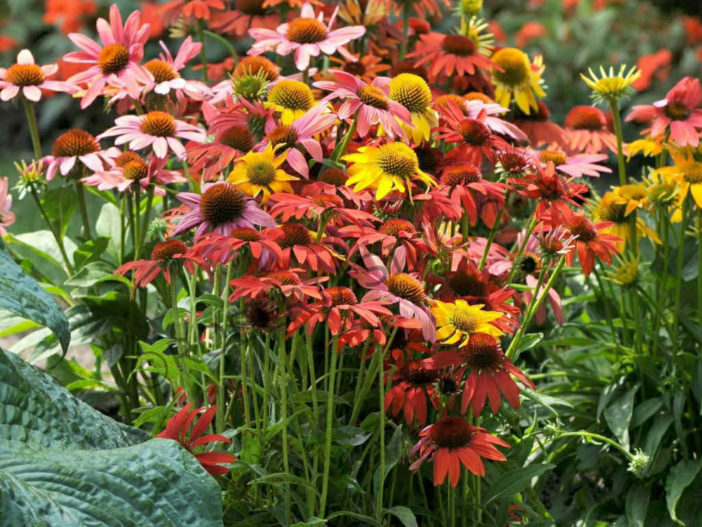 Coneflower can be planted in either spring or fall. Be sure to allow for good air circulation to prevent fungal diseases. The seeds germinate best with some cold stratification. The easiest route would be to sow them outdoors in the fall, either in the ground or winter sow in pots. If you are going to start seed indoors, simulate the chilling period by soaking the seeds in water and then placing the slightly damp seed in a sealed container in the refrigerator for 8 – 10 weeks. Then take them out and plant as you normally would. They should germinate within 10 – 14 days. For the most part, Coneflower have very few problems. I already mentioned giving them good air circulation, so they aren’t bothered by fungal diseases. If you should see mildew or spots on the leaves, simply cut them back and let them fill back in. Aster yellows, a systemic plant disease that causes growth deformities in the flowers. It can affect hundreds of different flowers, not just those in the Aster Family. There is not known cure and it is spread by a leafhopper, so affected plants should be removed and destroyed as soon as possible, to protect nearby plants. Coneflowers are often listed as drought tolerant, but they will do much better with regular water. I leave the plants standing through winter, to feed the birds. Shearing them back in the spring will result in bushier plants that bloom longer into the season. Deadheading is the primary maintenance required with Coneflowers. They are prolific bloomers and keeping them deadheaded will keep them in bloom all summer. Luckily each flower remains in bloom for several weeks. Flowers start blooming from the top of the stem. As the initial flower fades, more side shoots and buds will form along the stem. Keep the plants deadheaded and you’ll keep getting more flowers.